Living with King Richard: Richard III Visitor Centre - Dynasty, Death and Discovery. Richard III Visitor Centre - Dynasty, Death and Discovery. Ok ok, I know! I neglected to update my blog with the Richard III Visitor Centre opening review after all. Still, better late than never, so here it is! On Saturday the 26th July, after pre-ordering 2 tickets, my friend and I tootled off to a local cafe for a nice relaxing early morning cup of tea. This is where we met up with some more friends who also had tickets for the first available 10 am slot at the King Richard III Visitor Centre's opening day. The visitor centre has been created inside the building of the former Alderman Newton school, right alongside the car park where the remains of King Richard III were discovered in August 2012, and therefore also situated on the site of the Greyfrairs Friary where he was buried after the Battle of Bosworth in 1485. It is also situated just a stones throw over the street from the newly relocated statue of Richard III in the grounds just outside of Leicester Cathedral. Outside the centre there were some medieval re-enactors from Les Routier de Rouen group based at Bosworth. One of those present was a certain Dominic Smee, who was there prior to the airing of the Channel 4 documentary he appeared in later, Richard III: The New Evidence. And, of course, there was an array of journalists and photographers along with local tv news teams. Also spotted waiting outside was Dr Phil Stone, Chairman of the Richard III Society. There was an introduction by a town crier, and a countdown to the ribbon cutting ceremony by Mayor of Leicester, Sir Peter Soulsby, who officially opened the centre. I was very lucky, along with my friend, to be one of the first two people to enter the exhibition! We were directed past the ticket desk and the small gift shop area which is situated in the entrance foyer. So what can you expect to see inside the visitor centre? The first room you enter is the 'throne room'. While you take in the images around you, a film on the screen behind the throne tells the story of Richard III, and a poster on the wall explains each section like a play. Once the film has finished you walk through the exhibition, which tells the story of Richard and the Wars of the Roses, with both written and illustrated information on all the walls and displays. There is also a room where both prints and originals by the fine artist Graham Turner are currently exhibited. The centre is called RIII Dynasty, Death and Discovery for a reason, and the visitor is taken through all 3 of these sections of Richard's story in great detail. The first part tells all about the Plantagenet dynasty and how Richard came to the throne. Then we are taken to the Battle of Bosworth and the death of Richard III, with a very effective and emotive battle scene projected onto the wall. From there we discover how Richard's body was returned to Leicester by the victorious Henry Tudor, and buried by the Grey Friars in a high status location in the choir of their Friary - now the site of the visitor centre itself. Upstairs on the first floor is the 'Discovery' section of Richard's story. Here we see the story of the dig, the discovery of Richard's remains, the exhumation, and the identification process. There are interactive touch screen displays where you can keep the kids amused with different identification processes like DNA, and also the facial reconstruction process. The original reconstructed head, commissioned by the Richard III Society, and made by Professor Caroline Wilkinson and the forensic art team at the University of Dundee, is also on display here. In keeping with the 'clinical' theme of this discovery floor, there is a white suit of armour on display, which is all labelled piece by piece, and shows how each part was made to protect the wearer in battle. Back downstairs again, you may wish to visit the centre cafe for some light refreshments before heading into the actual grave site area, where the grave of Richard III can be viewed under glass. 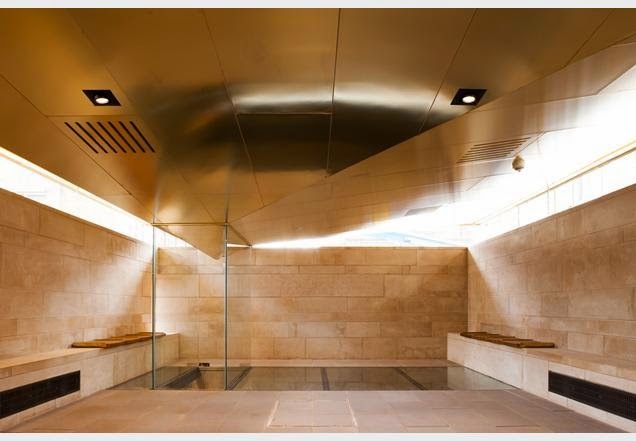 This room has been specially designed and built to reflect the solemnity of the grave site, but also the joy of the rediscovery of this medieval monarch and the newly- awakened interest in his story. Architects Maber used locally sourced materials for the grave enclosure, including limestone, stone flooring, and green oak, to try and replicate the kind of materials used to construct Greyfriars. The seats are situated intentionally in the exact same position as the seats in the choir of the Friary would have been when Richard was originally buried there. Sitting on them does give you that sense of contemplation and reflection of what you are actually staring at, the open grave of King Richard III. A projected image of the skeleton, as it was discovered, fades in and out every so often so you can see the exact positioning of the burial. Before leaving, there is the opportunity to take a look at the gift shop and buy various souvenirs including books, mugs, postcards etc. I think perhaps the gift shop could sell a larger selection of merchandise, perhaps like the range in the gift shop at Bosworth? Criticisms? Not really, although a few observations maybe. My first observation was that the reconstructed head is not shown to its best advantage in the wall display unit. 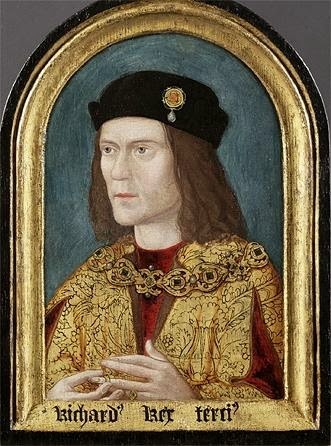 I saw this originally when it was displayed at the Leicester Guildhall temporary Richard III exhibition, and it was in a glass topped case on a pillar display cabinet which you could see from all angles. This would have been better used at the new visitor centre in my opinion. Also, I preferred the touch screen table with the info about the remains from the Guildhall exhibition to the scanner display on the Discovery floor. All in all, I think it is a very impressive, well laid out, visually attractive, unbiased, informative and educational experience, suitable for all ages and not just for history buffs! I can most thoroughly recommend a visit! All details can be found on the RIII Visitor Centre website. To try and make it a bit easier to visualise, here is a slideshow of my photos.